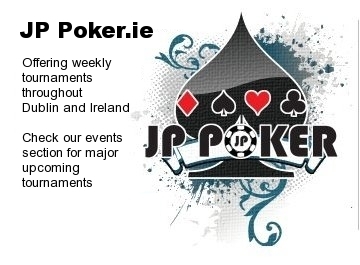 This weekend action returns to Dublin again, with JP Poker’s Mini WSOP. Missed the WSOP in Vegas? Make sure you do not miss the next best thing! This November we will be running a Mini World Series in the Maldron Hotel, Tallaght with €50,000 in Guaranteed Prize Pools. Each event starting stacks and blind structure will mirror the structures used at this years WSOP. Some minor changes have been made to this event when compared to Event 41 at this years WSOP. Mainly the last 3 players from each table go forward to the next round (with the chips they have earned) instead of just the winner. As a result the starting blind levels on the following rounds have been brought back a couple of levels to reflect the lower average stacks. This entry was posted on Monday, November 2nd, 2009 at 11:01 am and is filed under Poker News. You can follow any responses to this entry through the RSS 2.0 feed. You can leave a response, or trackback from your own site.